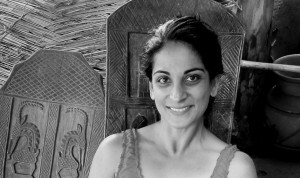 Dr. Sarah K. Khan holds a Masters in Clinical Nutrition, Masters in Public Health, and a PhD in Plant Sciences/traditional ecological knowledge systems. She has devoted herself to a trans-media art practice, creating compelling content across multiple disciplines with her work on food sovereignty and global sustainability. She makes visible invisible lives through multiple media. She uses food as an entry point to provoke thought about social issues of our times such as food justice, gender inequality, biocultural diversity loss, and climate change. Presently, she is a Fulbright-Nehru Senior Research Scholar in India. As a trans-media journalist, she is collecting and creating content about Indian women farmers, food vendors and porters and the challenges they face amidst rapid agricultural globalization, loss of biocultural diversity, effects of the Green Revolution, gender inequality, climate change and poverty. Her articles have appeared in Zester Daily, Culinary Backstreets, Roads and Kingdoms and academic publications.